Microgaming, one of the leading online casino game software providers, have a very large collection of Blackjack games available to play, via their fully downloadable gaming platform and via their no download, instant play casino platform. 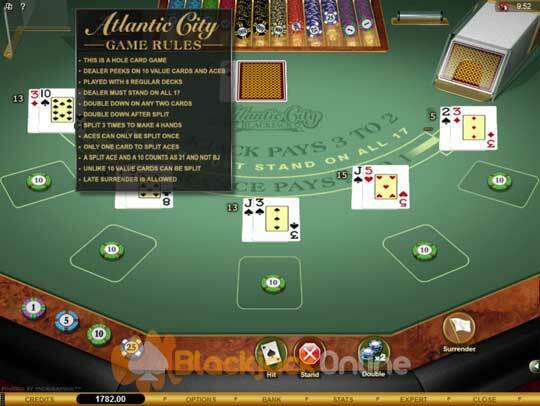 One Blackjack variant on offer is the Atlantic City Blackjack game. Whilst it does not boast the lowest house edge of their Blackjack game portfolio, the 0.36% house edge it does offer, when the game is played with perfect strategy is a fair one. 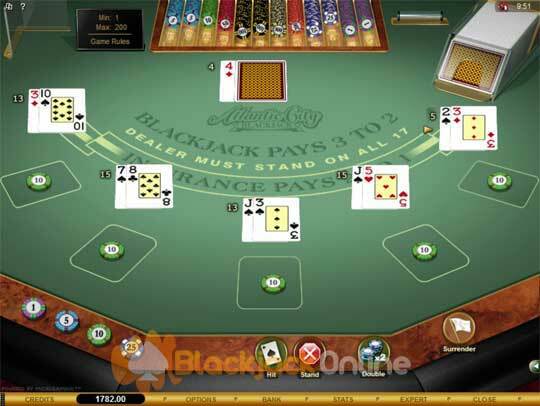 To give you an insight on how to play this Blackjack game, below is an overview of the game play rules, along with a selection of Atlantic City Blackjack tips. Plus to show you how to play every single hand you have been dealt, make sure you download and save our Atlantic City Blackjack Strategy Card (right). Playing a Pair of Sevens - When a player has been dealt a pair of 7’s, this hand can often be a difficult one to know how to play. However, all you need to remember is that you should split this hand should the dealer be holding a 2 to 7 valued card,or hit the hand if the dealer has any other card showing. Doubling Down a Pair of Fives - When you are playing this Atlantic City Blackjack game at a Microgaming software powered casino, should you have been dealt out, by the dealer, a pair of 5’s, then always double down unless the dealers card is a 10 or an Ace, in which case you should hit that pair of fives. Late Surrender - The aim of the Late Surrender option, is of course to get you out of the game when you stand very little chance of winning. This move should only be made however, when you have a hard 16 and the dealer has a 9, 10 or an Ace showing, or when the dealer is showing a 10 and you have a hard 15. Dealer Rules - When playing this Blackjack variant be aware that the dealer is dealing cards out of an 8 deck shoe. The dealer must stand his hand on any hand with a value of 17 (soft or hard) or above. He is going to take a peek at his additional card should his up facing card be a ten valued card or an Ace. Player Rules - This is quite a liberal game in regards to the player rules, and as such you will be able to double down no matter what the value of your initial cards are, plus double down is allowed even after you have split a hand. Splitting is permitted up to three times, but if you have split Aces just one card is dealt to them, and Aces may only be split once! This Atlantic City Blackjack game also has Late Surrender on offer to players, plus you will be able to split any pair of ten valued cards, even if they are not matching cards. Payouts - All of the payouts you will receives for winning hands are the standard ones, and as such a Blackjack hand will get you a payout of 3 to 2, all other hands pay even money (this includes a split Ace with a ten valued card. Insurance bets, when winning wagers payout at 2 to 1.